Prominent & Leading Manufacturer from Chennai, we offer scrap bin. Scrap Bin offered can be made available by us in durable construction finish as well as different finish specifications to choose from. 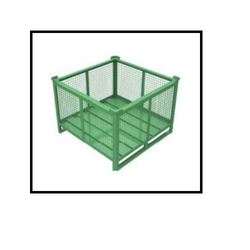 Further, these scrap bins feature mesh construction finish of raised sides which makes these provide for the stable holding of generated scrap. Some of its features include Finding extensive usage in different industry sectors; durable frame construction for lasting performance; quality surface painting support for corrosion safety; available in different widths and height choices; finish parameters can also be custom developed as per the OEM specifications provided by the customer. Looking for Scrap Bin ?